Etheridge pulled out a musical arsenal, playing several guitars, harmonica, drums and keyboards. 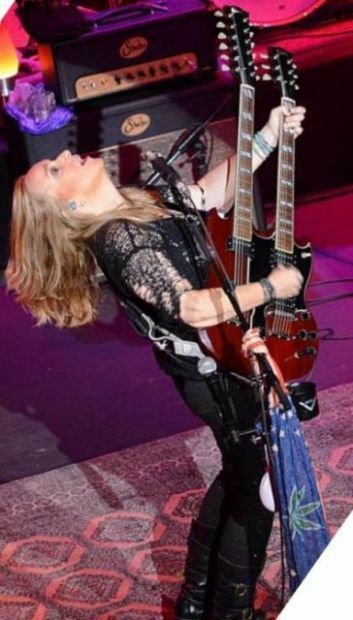 Singer-songwriter Melissa Etheridge was midstream into a stripped down acoustic version of her stinging rocker “All American Girl” at Centennial Hall Saturday night when she stopped singing. She strummed her acoustic guitar and looked out into the audience. The audience rose to its feet and turned toward Gabrielle Giffords, the former Tucson congresswoman who was sitting about a dozen rows from the stage surrounded by her husband, Mark Kelly, and former aid-turned-Congressman Ron Barber. The applause was deafening as Giffords, the victim of the Jan. 8 mass shooting in Tucson, raised her hand to acknowledge the attention. Etheridge’s fans were still applauding when she lit into the driving final stanza, performing it with the blazing energy and tempo that made it one of the singer’s most enduring female-empowering anthems. Saturday’s concert was Etheridge’s first here in 21 years. In 1992, she played a sold-out show at Tucson Music Hall and had intended to return in 2004, but canceled after being diagnosed with breast cancer. But it was what she performed in between that was the true genius of her performance. She pulled deep album cuts including “Goodnight” off 2001’s “Skin” and “An Unexpected Rain” from 2007’s “The Awakening,” singing them with the intensity of those hits that made her a multiplatinum, Grammy-winning artist. She played guitar on every song, taking the lead on acoustic and electric, and blasted away on harmonic to add a bluesy blister on “Shout Now.” She played keyboards on “4th Street Feeling” and a cover of Joan Armatrading’s heart-breaking “Weakness In Me.” She even banged on the drums with her drummer Blair Sinta. We didn’t’ see this multi-instrumental side of her in 1992. We’ve missed a lot during her absence. The heavy heart that she could never quite mask back then is a memory. She still sings her female-empowering anthems with conviction, but she delivered her heart-breaking tales of unrequited or unfulfilled love — “Come To My Window” and “You Can Sleep While I Drive,” with its lyric about driving through Tucson — with a little less pain. She is happier and healthier than she’s ever been, she told Saturday’s audience, then segued into “I Run For Life,” a song inspired by her cancer. Melissa Etheridge in concert at Centennial Hall Saturday night. Enviable lineup has a diverse mix of artists, genres. Grammy-winning singer opens tour at Fox Tucson Theatre.